CMP Products has carried out over 300 short circuit tests in accordance with the IEC 61914 standard ‘cable cleats for electrical installations’. These tests include various peak faults, cable cleat spacing intervals, and cable formations to conclusively prove the cable cleats’ ability to withstand and resist a range of electromechanical forces according to IEC 61914. CMP Products has the technical resources, capabilities and capacity to engage with its clients and deliver bespoke solutions to suit new or unusual situations. The company is able to conduct physical short circuit tests on any of its cable cleats for project specific applications including: specific cable size / type, fault current, cable cleat, and fixing centre / spacing interval configurations. defined (see IEC 61914 – Clause 5.1). This test is performed on the most critical size in each class. The test is carried out at ambient temperature, considered to be the defined temperature for permanent application, using unarmoured single core 600 V / 1,000 V cable with stranded copper conductor. A test rig is assembled using the selected cables and cable cleats, being the equipment under test, with the equipment and cables used being fully documented. The test is then carried out on the declared arrangement at the declared short circuit level. For the purpose of testing, the arrangement of the cables may be as shown in Figure 1, Figure 2 or any other configuration as declared by the manufacturer or responsible vendor. cable cleats and at least 3 intermediate restraints shall be used. Cable cleats and intermediate restraints, where used, shall be equally spaced. The cable cleats are fixed to a mounting surface defined by the manufacturer (e.g. cable ladder) which shall be suitably selected taking into account the electromechanical forces likely to occur during the test. Care is taken to ensure that the cross-sectional area of the cable is adequate for the magnitude and duration of the test current. The manufacturer’s or responsible vendor’s catalogue references of the cable cleats and intermediate restraint (where used), the assembly details showing the spacing intervals and the external cable diameter used in the test shall be recorded. The test set-up is subjected to a three phase short circuit for a duration of not less than 0.1 s. The duration of the test is recorded along with any other relevant data. there shall be no cuts or damage visible to normal or corrected vision to the outer sheath of the cable caused by the cable cleats or by the intermediate restraints, if used. Cable cleats and intermediate restraints classified under the aforementioned clauses shall comply with Clause 9.5.2. After a second short circuit application, a voltage withstand test is performed by applying a minimum test voltage of 2.8 kV d.c. for a period of (60+5 –0) seconds according to the provisions of IEC 60060-1:1989, ‘High-voltage test techniques – Part 1: General definitions and test requirements’, Clause 13.1, ‘Requirements for the test voltage’, and Clause 14.1, ‘Withstand voltage tests’. The voltage withstand test shall be administered between the cable cores and the mounting frame. The mounting frame shall be bonded to the earthing system. Where the cables incorporate screening or shielding, the screens and shields shall be bonded together and also bonded to the mounting frame. Where the cables do not incorporate screening or shielding, the cable jackets or sheaths and mounting frames shall be pre-wetted with sufficient water to facilitate a current leakage path along the outer jackets or sheaths. The cable jackets or sheaths and mounting frames shall be pre-wetted for (2+1–0) minutes before the test begins using water with a resistivity of (100+15–15 )?.m, which shall be measured immediately before starting the test. The cables shall meet the requirements of the voltage withstand test without failure of the insulation. The characteristics of the current during a short circuit depend on a number of factors, including the electrical separation from the generator. The figure below shows a current vs. time characteristic typical of a far-from-generator short circuit. The a.c. component in this case has a constant amplitude (I”k = Ik) and is superimposed on a decaying d.c component, i d.c. This falls from an initial value, A, to zero. 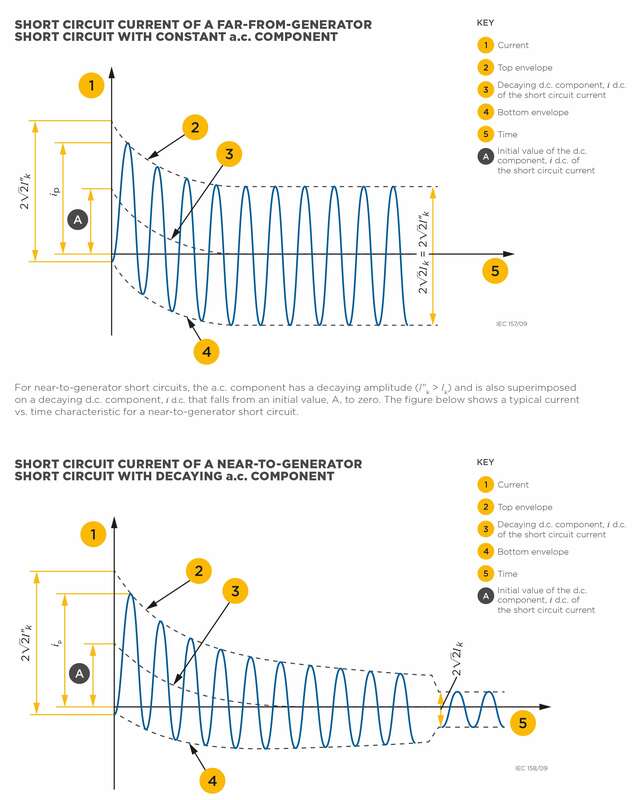 A complete specification of short circuit currents should give the currents as a function of time at the short circuit location from the initiation of the short circuit up to its end. In most practical cases, this is not necessary. It is usually sufficient to know the peak current, ip, and the values of the initial r.m.s symmetrical, I”k, and steady state, Ik, currents. the short circuit duration, t.
i(t) is the momentary current in the neighbouring conductor. If the d.c. component of the short circuit current is disregarded, the momentary force has a sinusoidal variation with a frequency twice the frequency of the currents (Equation B.1). The d.c. component gives a decaying force-component with a frequency the same as the system frequency. In this equation, the force is given in N/m, i in kA and S in metres. The evaluation of Equation B.4 requires S >> d but gives an acceptable accuracy when the current distribution is uniform (or symmetrical) within the conductors. The vector Equation B.3 confirms that two parallel conductors are repelled if the two currents have a difference in phase angle of 180° and that the force is directed towards the other conductor for currents that have the same phase angle. In a three phase system, the magnetic field in Equation B.2 is the resulting momentary vector value from the other two phases. 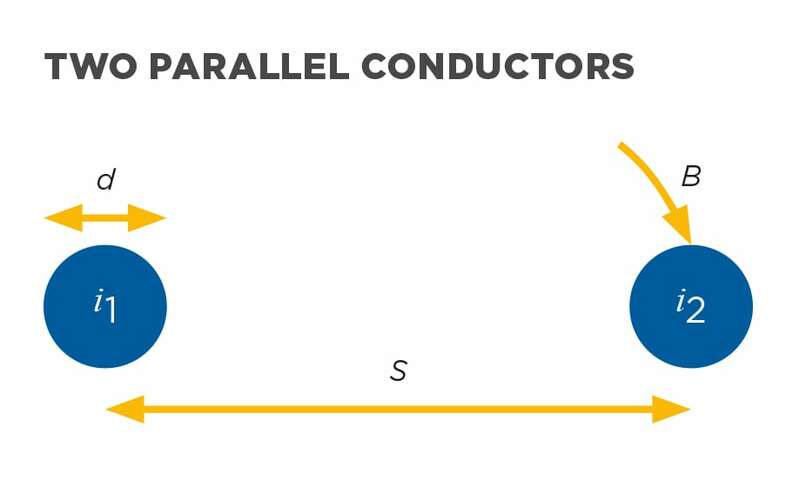 S is the centre to centre distance between two neighbouring conductors [m].